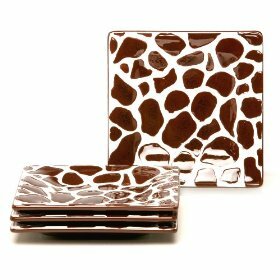 Set of 4 Giraffe print appetizer plates, square silhouette moves easily from casual to formal occasions; Includes 4 – 6.0″ canape plates. Designed in California by Laurie Gates. Composed of high-fired ceramic earthenware (canape). Dishwasher-safe; Microwave at low settings only as item become warm/hot to touch after heating. Use precautions when removing item from microwave. Made in China.